Hello, my name is Ali and I love food. Ever since I can remember food has been a major priority. I am always thinking about what and when my next meal will be. My husband can verify that after any meal, one of my first questions is what we are going to do for the following one. Food is just something I completely enjoy and sometimes obsess over. Now while I do have a major sweet (aka chocolate) tooth, I luckily also have strong healthy cravings too. Or as my husband calls it, grog cravings. Am I the only one who craves roasted squash for dinner? Maybe so. But because food is such a huge part of my life, I had to add a Food category to my blog. Whenever we take a trip, I do my research to find all the great foodie joints and must eat restaurants in whatever city we are headed to. For our trip to NYC, I actually printed out a paper map of the city and plotted all the foodie destinations that I wanted to visit. (I am also a very visual person!) This was not our first trip to New York. It is actually our favorite place to go together and we have gone many times as well as I lived there for a spell out of college. It is an amazing food town and truly everything we ate on this last trip was remarkable, but if I had to chose one thing that really blew my mind it was the sundae at ABC Kitchen. ABC Kitchen won the James Beard Award in 2011 for best new restaurant. We have been there 3 times in the past and though I was determined that we go to new places this trip, we had to eat here. Because it is very well known, reservations are a must even for lunch. I made ours a week before the trip and we ended up with a 1:30 reservation. ABC Kitchen is a revelation. The food, the decor, the attention to detail. Our whole meal was cause for discussion and photo taking, but being a dessert girl, what really put me over the edge was the sundae. 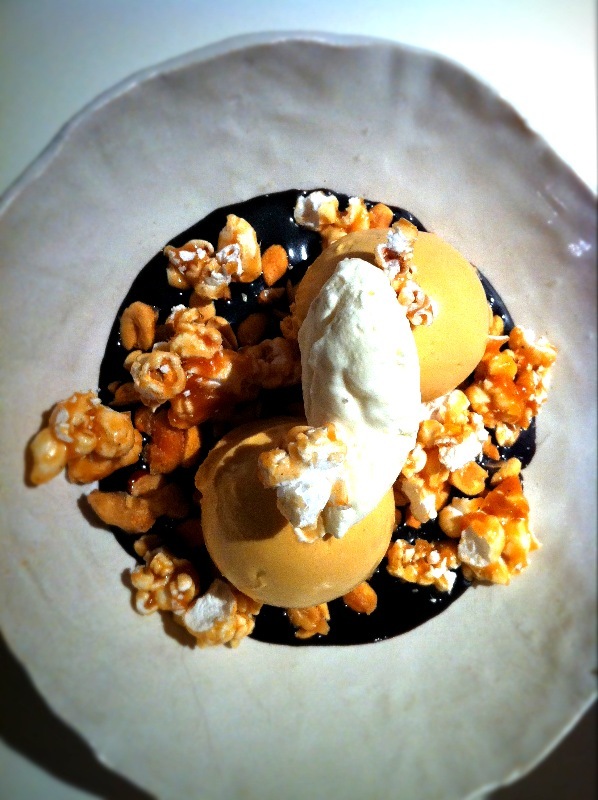 Salted caramel ice cream, candied peanuts and popcorn, whipped cream and chocolate sauce. All homemade of course. A sundae? You may say. What is so special about a sundae? The candied popcorn would be my reply. Why has no one ever thought of putting popcorn on a sundae before?! It was true perfection. The delectable crunch was the perfect compliment to the entire dish. I couldn’t help but make a “mmmm” noise after every bite. I ate it slowly and enjoyed every mouthful. The next time you go to NYC, you MUST visit ABC Kitchen. Even if you don’t get the sundae, I can say without any doubt that it will be one of the best meals you have ever had.